This slim leather wallet has three card slots on one side, an ID window on the other, and a zippered compartment. Everything about this wallet is shielded. It starts out ultra-thin, but can expand as you add multiple cards. Perfect for a front shirt or pants pocket or a compact purse. This mini wallet is the perfect answer to protect your credit/ID cards. Both men and women love this wallet! Did you know that many credit cards, driversﾒ licenses, transit cards, government identification cards, school, hospital, and company identification cards, all passport cards, and all US Passports issued since October 2006 as well as passports from many other countries have a Radio-Frequency-IDentification (RFID) chip embedded inside them? These chips allow vendors to scan your credit card quickly at the checkout and allow authorities to scan your ID or passport from a distance, making border crossing a little faster. The Radio Frequency ID chip in a credit or debit card emits the account number, expiration date and other information. If your credit cards, identification cards or passport were scanned nefariously, it also makes stealing your identity a whole lot easier. Identity Stronghold is a company committed to helping you keep your identity safe. They have created a shielding technology that blocks radio waves and prevents scanners from reading the chip inside your cards and passport. That's why itﾒs important to keep your cards and passport inside a shielded holder at all times, unless asked by the authority to remove it for inspection. 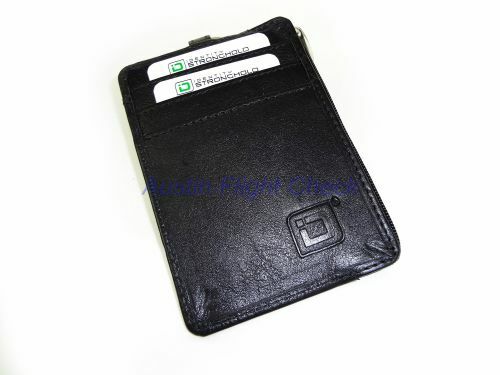 Our genuine leather RFID blocking wallets feature the ABSOLUTE BEST RFID shielding on the market. Every single pocket on every single wallet is entirely shielded individually, locking your personal information safely inside. Thanks to this smart design, even when your wallet is wide open, each card remains protected. Our RFID wallets will shield all contactless credit and debit cards as well as passport cards, enhanced drivers licenses, transit cards, HID iClass cards, TWIC cards, PIV cards, CAC cards, LincPass cards and others. Identity Stronghold is committed to helping you keep your identity safe. We started the RFID protection industry in 2006. We continue to lead this industry by creatively applying shielding technology to a variety of products that block radio waves and thereby prevent thieves from remotely accessing your private information (including your complete credit and debit account numbers). Beware of imitations that aren't made by Identity Stronghold. We have tested many of those knock-offs in-house, including some of those hard metal wallets. Many do not shield effectively. In fact, some knock-offs actually include documentation admitting they are not 100% effective.